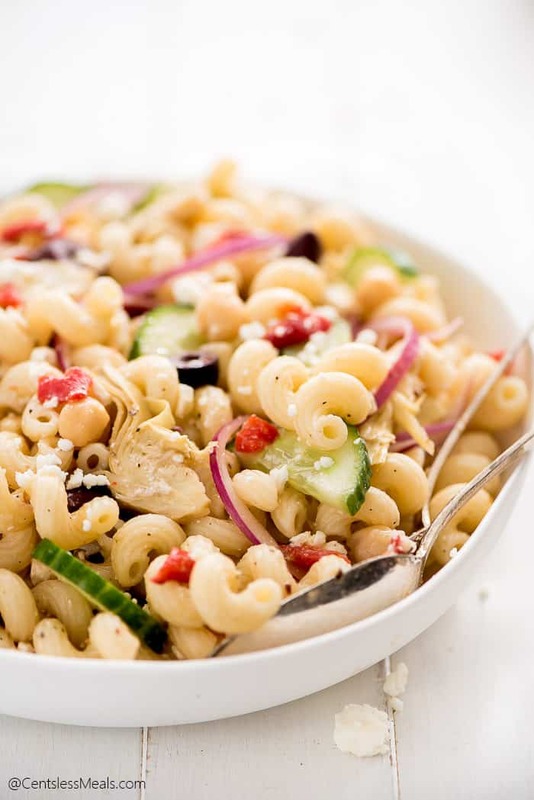 Mediterranean Pasta Salad is a healthy, cool, and refreshing dish tossed in a simple Greek vinaigrette. 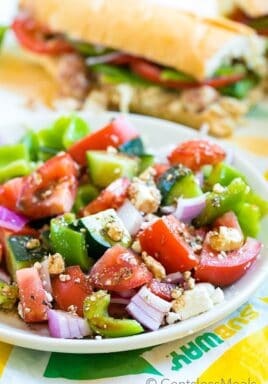 It’s the perfect meal for a hot summer day or to bring as a side to your next barbecue. 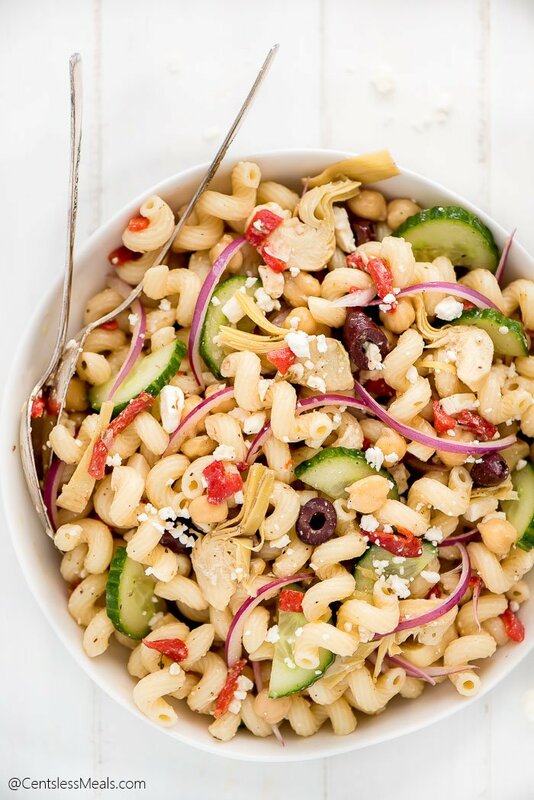 Pasta Salad is one of my favorite things to eat when it’s warm out and this Mediterranean Pasta Salad is my new favorite. It comes together quickly, it’s refreshingly cool, perfect for transporting to a barbecue, and it’s full of healthy veggies. 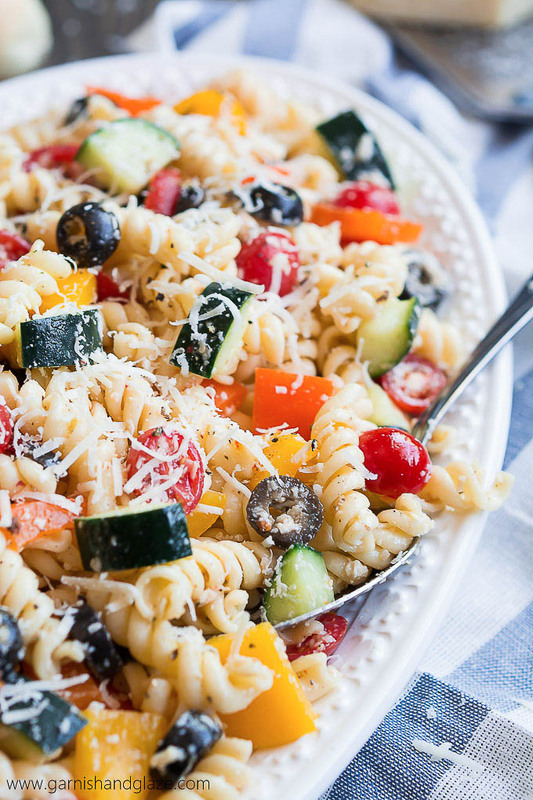 How to Make Pasta Salad? The first step is to get your pasta cooked. You’ll want to make sure you salt the water thoroughly so that the noodles are well seasoned. 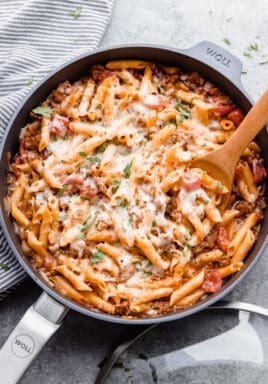 Once they are done, drain the pasta and place it in a bowl of ice water so it can cool down completely. Once the ice has melted and the noodles are chilled, drain off the water and place the pasta back in the bowl. While the pasta cooks, chop up the veggies and drain and rinse the beans. I like to cut the onions and cucumber thin and cut the artichoke hearts in half so that they are more bite sized. You can use roasted red bell pepper in this but pimientos already come chopped up and I’m all for taking shortcuts. 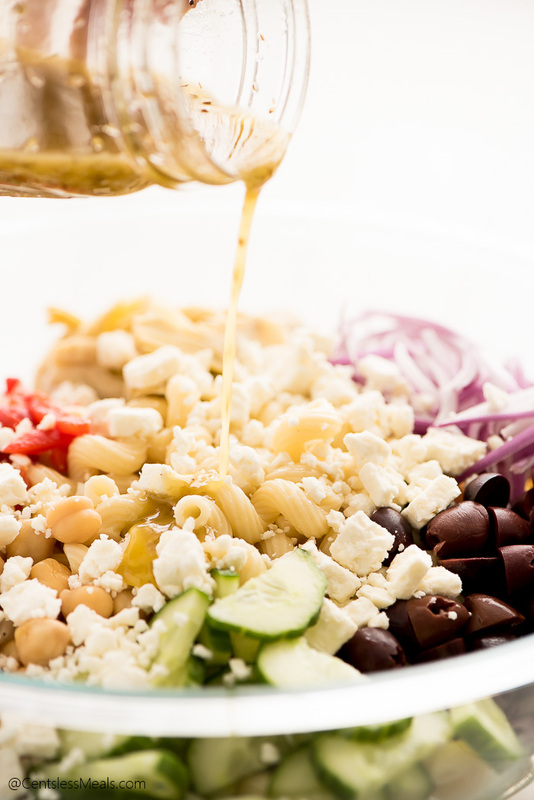 The last step to making this salad is making the dressing. 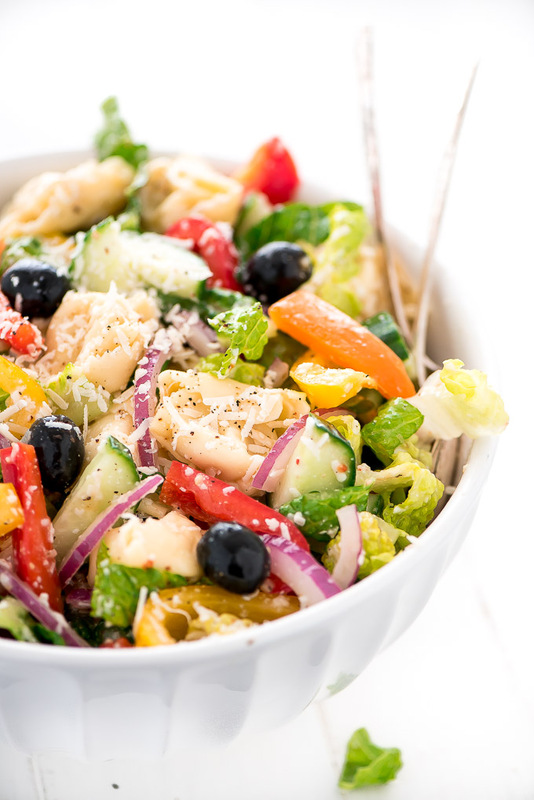 Don’t be intimidated about making your own dressing! All you need are a few simple ingredients and a jar. Place the oil, vinegar, lemon juice, garlic, oregano and salt & pepper in the jar and give it a good shake. Yes! That’s partially why I love this salad so much. It lasts for up to 4 days in the fridge. 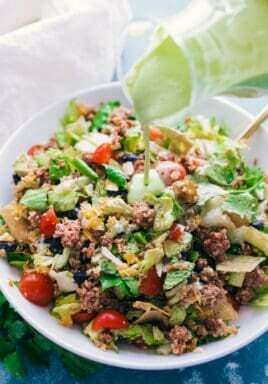 It’s the perfect salad for taking to a potluck or meal prepping for lunch or dinner for the week. Enjoy! 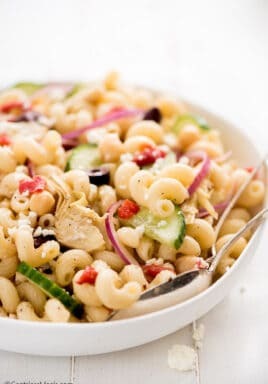 Mediterranean Pasta Salad is a healthy, cool, and refreshing dish tossed in a simple Greek vinaigrette. 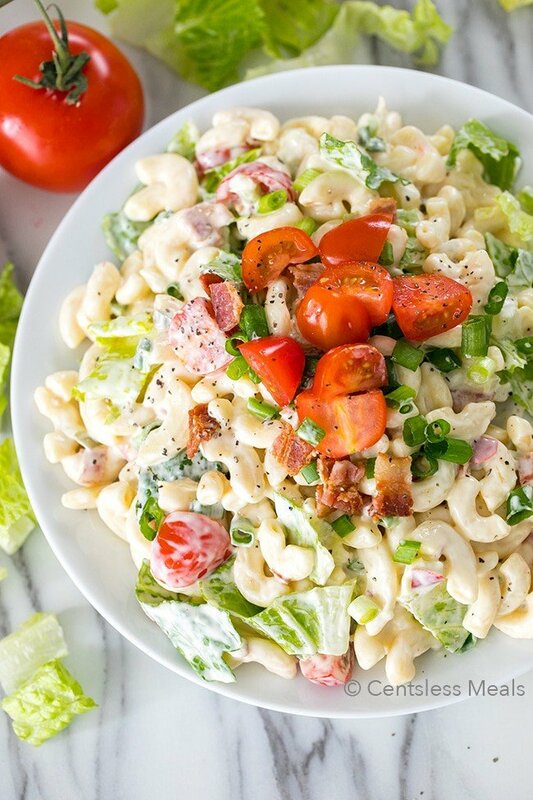 It's the perfect meal for a hot summer day or to bring as a side to your next barbecue. Cook pasta in salted water according to package. Drain and then place in a bowl of ice water until chilled and then drain again. 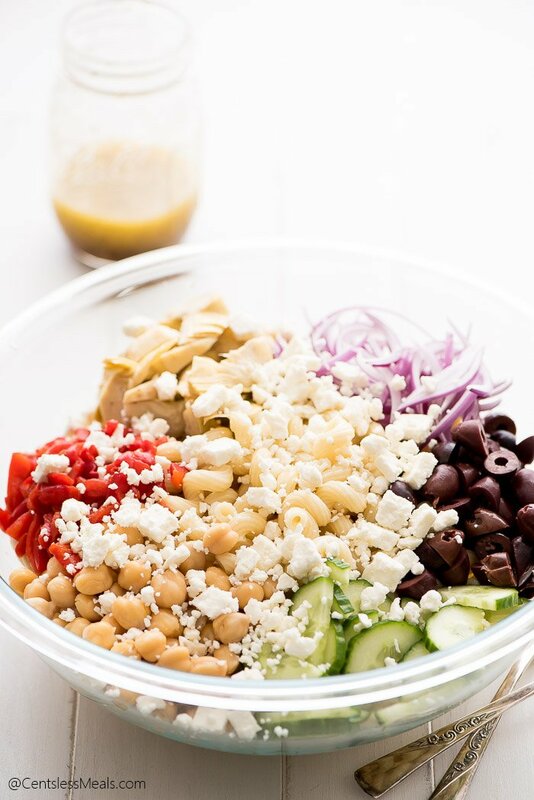 In a large bowl add pasta, cucumber, chickpeas, pimientos, artichoke hearts, red onions, olives, and feta cheese. Pour dressing over the top, toss, and serve. Place dressing ingredients in a jar with a lid and shake to combine.